A holistic community centre in North Bristol is gearing up for an open day on September 15 when local people are invited in to meet the therapists, teachers and trainers who work there. Sadie Willis opened The Flamingo Centre at 175 Southmead Road, close to the site of the old police station, about 18 months ago. She started off with just two workshops last April but now has over 100 events running every month. These range from one hour classes to two-day training courses. In addition, the centre will be offering 3-12 month Holistic Training courses from January, accredited by VTCT examination board. There is something for everyone here - visitors to the centre range from seven days old to 70+ years. The many classes and workshops on offer including Yoga, Pilates, Spanish, Arts & Crafts, Self Development and a variety of Healing Workshops. The Flamingo Centre also offers a range of holistic therapies within its calm and tranquil treatment rooms. These include reflexology, aromatherapy massage, Reiki, Kinesiology, acupuncture and counselling. 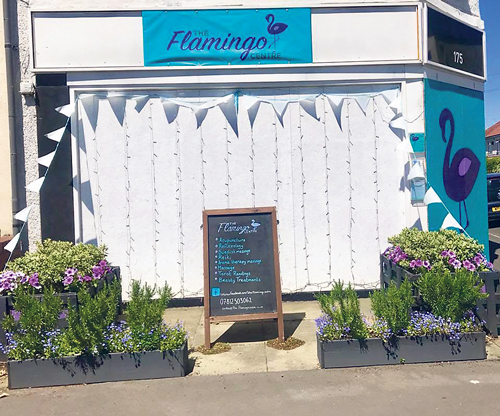 Sadie was inspired to open The Flamingo Centre after experiencing four years of pain following a bout of cellulitis (a bacterial infection) which she contracted after she cut her ankle. She spent much of the period in a wheelchair but to help her recovery she sought out the help of complementary therapists and met many fascinating people along the way. Once better, Sadie decided to bring all these people together in one centre and trained in massage and reflexology herself. As well as offering courses and therapies, the treatment rooms and the main room which is suitable for meetings, parties and training, can be also be hired out. Wiggles and giggles classes are a regular weekly feature and a range of classes for children and teenagers are offered during the school holidays, such as Hair Hacks, Musical Theatre and an Embroidered Unicorn Workshop. To find out more see facebook: www.facebook.com/theflamingocentre or contact Sadie on 07812 503062.